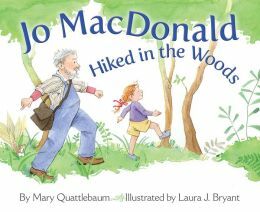 This delightful picture book uses a favorite children’s song to accompany a little girl and her grandfather on a hike through the woods. Each time they come upon a new animal, the song’s repetitive E-I-E-I-O ends with a fun twist related to the animal. For instance, the chipmunk ends the verse with chomp, chomp. The active verbs in the story are related to different actions or sounds that people and animals can make, for example, walk, pad or shuffle, shuffle. A fun reading activity would be to have students “hike” around the classroom changing their steps to match their new vocabulary words. Many literacy skills can be strengthened and practiced with this story. Rhyming words, sequencing, rhythm and reading for details are just a few. The illustrations are correct so students will learn about the animal habitats and habits from the picture clues. In-depth information about each of the animals can be found in the end notes and read aloud with explanations for the younger students. Second grade readers will greatly enjoy reading this book on their own. Young readers will enjoy hearing it read aloud over and over as they sing the song along with you. Reading games will be fun to create using the information Mary included in the back of the book. There are nine animals included in the books and three of them are nocturnal. There is a great opportunity here for cross curricular activities and to meet the core curriculum science and nature requirements. The information in the back, meant for grown-ups, provide activities related to science, being a naturalist, and being a courteous hiker. This is the third in a series of books about Jo MacDonald. Her first two adventures included: Jo MacDonald Saw a Pond and Jo MacDonald Had a Garden.